The term „digital transformation“ is a buzzword that is used and abused with multiple meanings. Since 2005 the usage of digital technologies and its potentials have changed markets and industries fundamentally, especially as these technologies give users the choice how to satisfy specific needs. Some call this the „digital revolution“ according to a Kondratiev wave analog to the industrial revolution in the late 18th and 19th century. Digital transformation refers to these changes with a modification of companies‘ existing technologies and business models. Digital transformation is based on people, processes and technologies and is relevant for any company that offers services or products online. 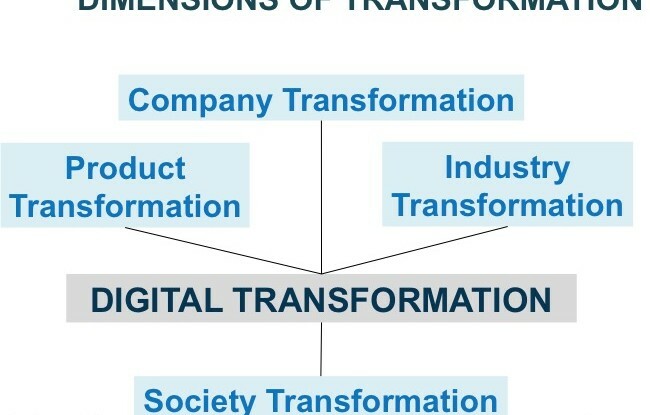 You can split digital transformation in four different dimensions that can apply parallel, shifted or sequential: product transformation, company transformation, industry transformation and society transformation (see Figure 1). Product transformation can be internal related to a companie’s products and services or external related to a specific product category. Why is digital transformation so important? Digital transformation should be part of any digital strategy. Clearly spoken, a company without any digital strategy has no future strategy and risk its existence. If companies miss to transform their strategy into digital and leave the market you can call it „digital Darwinism„. According to a Gartner study in 2020 there will be more than 25 billion connected „things“ such as devices, cars, homes and wearables. So who will buy unconnected things in the future if nearly everything will be connected? Also in 2020 about 80% of revenues will be related to additional services and only 20% to the core product itself, similar as we know it already from existing app and widget ecosystems. I collected nine pillars that could help companies to prepare and drive digital transformation in their organization (see Figure 2). To be able to transform existing and established models you need to install a „mindset of change“. This is not only related to technologies or development, but to whole organization. It should start with an impulse on top management level driven top-down and parallel in specific teams driven sideways and bottom-up. Specific teams means groups that are more open to change and that are less hierarchical organized anyway. Change is often creating resistance as some employees might understand it as a threat for status, role or even their job. It will take time, patience and some distinguished supporters to Establish such a different mindset. Mostly it makes sense to start in one department creating first positive signals of change. It is impossible to get everybody convinced and there are often also new skill sets required to transform products, services and organizations. Beside an investment in employees‘ training and coaching you need some new talents that already have some of the necessary new or modified skills to support the process of change. It is very important to have the HR team committed and involved in the whole initiative from the very first beginning. The idea to put users of a product or service in the center of concept and development is not new at all. Many product managers might say: „We already do this for years“. But such an approach needs an organizational form and the understanding of all involved teams that is based on a continuous user dialog. There are multiple methods how to discover what are the most important user needs and what creates user stickiness. All these methods are based on iterative testing and adaption according to user input/feedback and created (digital) value. Customer integration is a clear commitment to focus on existing and future needs of users and supports the process to discover successful disruptive innovation. Does the current business model still fit to the existing demand and customer needs? Is there any growth in users and revenues? Are there any new technologies on the horizon that could change user behavior and demand? A good example is how the way people buy and consume music has changed in the last 20 years. First CD sales shifted from offline stores to online shops in the late 90s, than people started to download music. As there was no common infrastructure and no simple standardized solution in place to buy and download music online, many users shared songs online for free illegally. The music industry tried to protect the existing business model instead of innovating and transforming. Apple’s iTunes was the breakthrough for legal paid music downloads. Currently users switch to subscription based music streaming services such as Apple Music or Spotify. The music CD is already dead and music downloads are riding into sunset. It is always tough to change existing business models and revenue streams as long as they seem to work „somehow“. It is even more difficult, if the change requires a modification of an established value chain. That is why companies from other industries or even small startups often step successfully into existing markets with a different or totally new approach. In 2014 Airbnb, a marketplace for renting lodgings founded in 2012, sold more accommodations as the whole Hilton Group, founded in 1919. Agile concepts are a common toolkit to drive change and serve as a framework for customer centricity. Scrum is an agile framework for software development based on empirical process control by transparency, inspection and adaption. Many of Scrum’s agile principles can be used outside of software development in any department or project. These are cross-functional collaboration in teams, self-organization inside the teams, a prioritization based on (digital) value and an iterative realization process instead of a static long term planning. Agility means for companies and teams also the acceptance to make mistakes and to understand those as a part of their leaning process. This pilar adds data to the commitment for customer centricity. Any new product idea, feature or potentially improvement of a product or service can be tested with users. There are multiple methods to validate ideas, concepts or prototypes with users or even to discover and create a best-practice option in collaboration with users. Such an approach reduces the risk to fail with an idea or product as the design is based on „measured“ existing or future needs of real users. General speaking, data does not only help to save money, it is money. Data is a key driver of the mentioned digital revolution. The succes of some of today’s most valuable companies such as Apple, Google (Alphabet), Microsoft, Facebook and Amazon is build on data. These companies produce, collect and analyze data to make decisions and to create (digital) value for their users and their company. Digital value is the validated positive outcome of data driven decisions. Any prioritization of functionality and features has to be driven by its digital value. Digital value means an online driven, measurable direct impact for a company’s value chain such as business value (e.g. direct or indirect monetarization) or user experience value (e.g. engagement) or internal process value (e.g. huge improvements of the velocity of specific tasks). The value is created because a specific new user need was satisfied or an already existing user need was satisfied better or more efficient than before. This pilar refers to the fact that digital transformation often includes something radical and disruptive that mostly cannot be realized based on implemented and established technology. How would you build a technology set-up for your company if you could start from scratch today? What is the key difference in such an approach and what is the key USP compared to existing competitors today? The idea of „re-coding“ sounds expensive, but can help to identify the most weak parts in the current technology. Today, a main requirement to software architecture is changebility what means a modular lean structure is preferred over monolithic „all-in-one“ solutions we know from the past. That does not include a kind of total technological flexibility what could be much too complex and expensive. Modularity means to create a core and to build modules around it, to use APIs and also 3rd party modules. The microservice architecture follows these paradigms. Not every feature or service has to be developed from an internal team, especially if there are standard solutions already available on the market, that could be integrated in such a modular architecture. Simplicity is a second requirement for technology. This could be rated as inconsistent with the requirement of changbility, but it is not. Only a good balance between both is necessary. 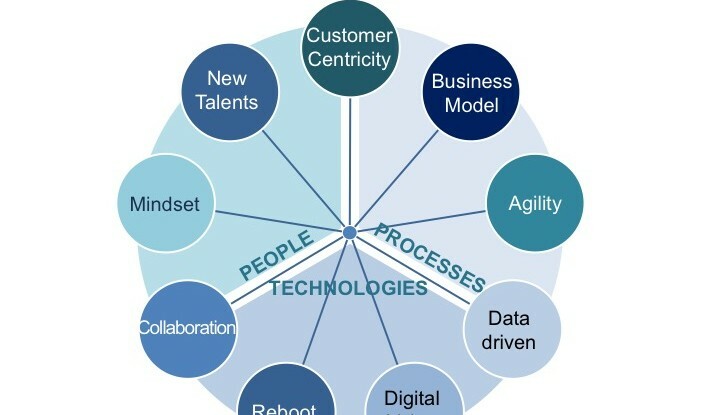 Collaboration is the connector between mindset of change, customer centricity, agility and digital value and the enabler of a successful digital transformation. Somehow collaboration is a consequence if a companie’s change strategy is supported by the main operative stake holders in key departments. Collaboration inside the company means also to share responsibilities and to work in cross-functional teams. You need to build expert teams with the most skilled people to solve a specific task or create a specific solution, independent from boundaries of departments. Boundaries of departments should be understood as lines, not walls. Collaboration means also to integrate external partners, suppliers and users to creat the best possible solution. There are many examples of a successful user integration into companies‘ innovation process or even of product innovation communities, stimulating user driven innovations for specific brands or products. How long is the process of digital transformation? The time frame of a digital transformation is depending on the specific existing business and the size of the company. It seems more that digital transformation is tending to be a permanent process that is morphing from one wave to the next. At the DigIT Conference in Berlin 2015 Heiko Meyer, Managing Director HP Germany, has explained the 5 years plan of HP’s digital transformation journey. Also after 5 years the real journey will rather start than end. 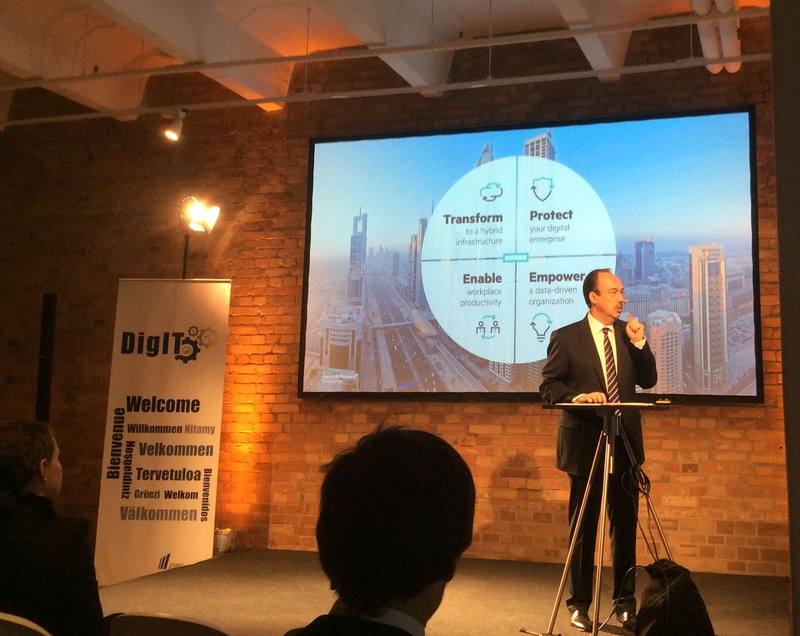 Axel Springer SE, a traditional German publisher, has started its digitalization in 2006. In the first half of 2015 more than 60% of revenues are related to digital business models. The whole process was and still is digital transformation. Also companies that have alreday a 100% digital business model need to transform to the next digital level as markets and user requirements are evolving. So digital transformation is only a first step of a continuous change process that could be better described as digital evolution. The unknown company: How to attract job seekers? In the so called “war for talents” big brands such as Hugo Boss, Audi or Google have an unbeatable advantage. They are also employer brands and get often enough applicants because potential talents have already a passion for their products or company. How can an unknown mid-size company compete in such a race? Many companies look desperately for very rare profile candidates, e.g. in the IT or engineering segment and several of them have a lot to offer: Great workspace, free fruits and drinks, leisure offers (fitness club, table soccer), child care, free language trainings, health care or life insurance or pensions (especially UK)… But how can companies better reach potential talents and make such benefits more visible? To build an employer brand is a long term strategy that will take time. A first step is a more creative usage of a simple job posting. The posting is a direct contact point with potential candidates. Many companies still do not understand that they have also to apply for candidates and that it is not enough to post a job and pray for getting the right applicants. A posting should not be a simple text ad with a logo, it could be advertsing for the company showing real people, products, workspace and office. To apply and be ready to change a job is also a very emotional moment. You have to gain trust even to make the candidate send his application. Trust is based on transparency and positive emotions. 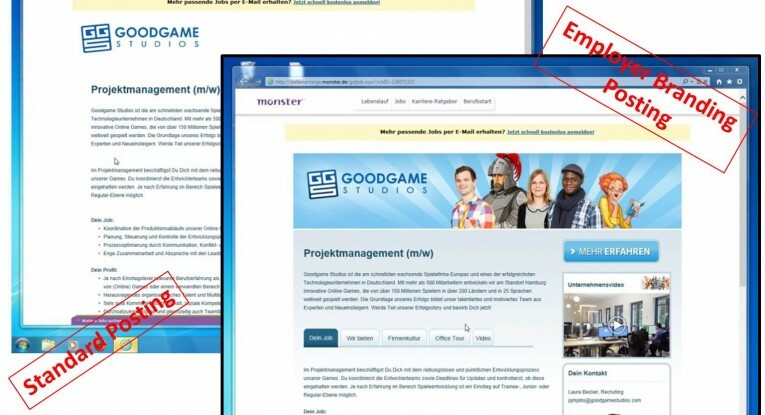 A scientific study of the Goethe-University of Frankfurt/Main (Germany) compared a plain text job posting (standard ad) with a designed job posting (employer branding ad) that includes multiple pictures, a company video, interactive elements and was structured like a website with a simple navigation. The study was based on a multi-method experiment design combining pre-survey, laboratory experiment including eyetracking and post-survey with 180 persons. The research was conducted with two groups, each 90 persons that have seen only one type of posting, the standard ad or the employer branding ad. Both ads were for the same position and company (midsize, no top 100 brand) and had the same text description. The participants had to answer the same questions before and after they have seen the specific posting (rating on five point Likert scale). They did all not know the company before the test. 1.) The residence time on the employer branding posting was with 3.7 minutes nearly the double of the residence time on the standard positing (1.9 minutes). 2.) All image related evaluations shown a significant uplift after the participants have seen the employer branding posting, while there was no real change for the standard ad. For example the company was rated as more likeable, more authentic, more reliable and even more successful (compared to the standard posting). While the first two are explainable through the pictures of employees and the company video, the last two are definitely a subjective impression. The results show that such a designed posting with company insight can bring a candidate in a very positive emotional mood. Finally another result was that the willingness to apply for a job at the specific company increases with an employer branding ad. The employer branding job posting was created and invented in late 2012 by my team and me at Monster Worldwide Germany. It is including full compatibility also on mobile devices (responsive design). Still it is not used by enough companies. Some firms do not understand the need for such an approach, some are still afraid to create a transparent picture of their company. But it is an opportunity, not a risk, especially as the current Generations Y or Z expect more transparency and authenticity than past generations. In times of social media it is difficult to hide something for a company, on the other hand there might a lot positive to show if communicated proactively. The employer branding job posting is no universal remedy against too less applicants, but an interesting and important tool for recruiters, especially for companies with not well known brands. The impact of social media and mobile devices on our daily life is pervasive and lead to profound changes. These changes still show a wide range of regional differences in intensity and dynamic and affect many industries, also the recruitment and applicant market. Social media and social networks induce significantly altered behavior patterns of job seekers. In other words, the new possibilities lead to additional ways how to find jobs, how to become aware of new career opportunities and how to proceed when applying. 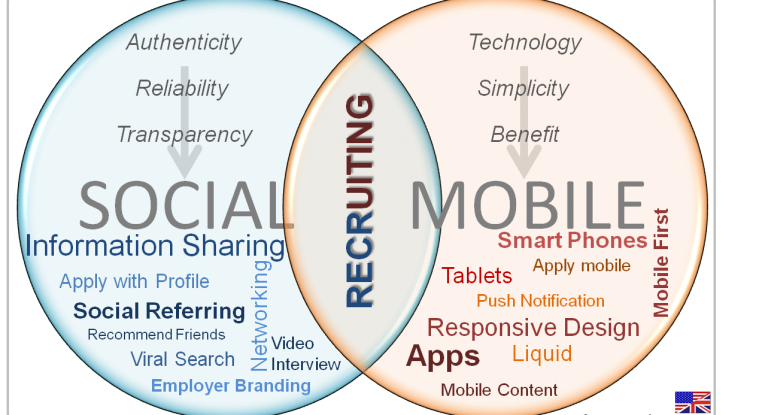 Simultaneously social media offers for companies and recruiters additional options to spread vacancies online or to search for potential employees. In particular it is easier to reach so-called passive candidates. More and more people, who could imagine a job change, would prefer to be found by the new job instead to search for a new job. In Germany 40% of all seekers act as such passive seekers (Recruiting Trends 2013). Within social media it is especially the sharing of information and an increasing recommendation behavior that work as catalysts to fill a vacancy. For a successful integration of social media in the recruitment process it is important to pay attention on authentic content and credibility of corporate messages. The target group, means social media users are extremely critical and do not forgive companies if posts or any other social activities seem to be a fake or not authentic. A huge number of failed viral recruiting videos even from top brand companies show unplanned negative feedback from the target group. It is not necessary to invest a big budget to create an authentic and successful viral video clip. Twitter demonstrates how to create a video with a small budget based on humour and motivated employees. This is a credible and likeable presentation of the employer brand and matches with the company identity. But of course that does not work for every company. E.g. a bank needs to stay serious and trustable also in a viral clip even if the target group of this activity is below 25 years. Nevertheless, especially for unknown brands and SMEs social media offers a favorable platform for effective employer branding. Unfortunately, some companies understand the need for transparency still more as a threat rather as an opportunity. In 2012 only 3.1% of new hires in the German top 1,000 companies resulted from social media channels. However, social media is not a replacement for traditional recruitment channels but an important addition, depending on position and target group of candidates. According to the recruiting trends 2013, 56.7% of German job seekers like the integration of social media channels into companies’ recruiting activities. Despite this, over 60% of the seekers still use classic job boards as a primary tool for job search. But more than 62% of Germans students are connecting via social networks with companies when they start to look for their first job (Microsoft / Unicum 2012). This is at least an indication that this generation will likely have no reservations to use social media as active element in their future career planning. Social Media und der Einfluss mobiler Endgeräte auf das tägliche Leben sind allgegenwärtig. Die Folge ist Veränderung, wenn auch mit regional unterschiedlicher Intensität und Dynamik. Auch der Rekrutierungsmarkt bzw. der Bewerbermarkt bleiben von dieser Veränderung nicht verschont. Soziale Medien und Netzwerke führen zu deutlich veränderten Verhaltensmustern bei der Jobsuche. Oder anders gesagt, die neuen Möglichkeiten führen zu zusätzlichen Wegen, wie man Jobs findet, auf neue berufliche Optionen aufmerksam wird und wie man bei der Bewerbung vorgeht. Gleichzeitig bieten die sozialen Medien auch für Unternehmen und Recruiter zusätzliche Optionen, Vakanzen online zu verbreiten oder nach potentiellen Mitarbeitern zu suchen. Vor allem so genannte passive Kandidaten können viel besser erreicht werden. Immer mehr Menschen, die sich einen Jobwechsel vorstellen könnten, möchten lieber vom Job gefunden werden als selber danach zu suchen – in Deutschland über 40% (Recruiting Trends 2013). Innerhalb der sozialen Medien wirken vor allem das Teilen von Informationen (das so genannte „Sharing“) und ein zunehmendes Empfehlungsverhalten als Katalysatoren für das Besetzen von Vakanzen. Um die sozialen Medien erfolgreich in den Rekrutierungsprozess einzubinden, ist auf authentische Inhalte und Glaubwürdigkeit der Unternehmensbotschaften zu achten. Die Zielgruppe, also Nutzer die soziale Medien aktiv leben, ist hier extrem kritisch und verzeiht Unternehmen selten, wenn Beiträge oder Aktivitäten gestellt wirken. Die zahlreichen missglückten Viralvideos namhafter Unternehmen auch im Bereich Rekrutierung zeigen eher ungewollte Verbreitungseffekte. Dabei braucht man nicht unbedingt ein großes Budget um ein authentisches Rekrutierungsvideo zu erstellen. Twitter zeigt wie man mit Witz und motivierten Mitarbeitern glaubhaft die Arbeitgebermarke präsentiert. Aber natürlich passt das nicht zu jedem Unternehmen – die Identität des Unternehmens muss in jedem Fall gewahrt bleiben. So kann eine Bank ihre Botschaft sicherlich modern und humorvoll gestalten, sollte aber dennoch immer serös bleiben und die Ansprache im Vergleich zum Unternehmensauftritt nicht grundsätzlich verändern, auch wenn die primäre Zielgruppe der Aktivität unter 25 Jahren liegt. In jedem Fall bieten die sozialen Medien gerade für unbekanntere Unternehmen und den Mittelstand eine günstige Präsentationsplattform für effektives Employer Branding. Leider verstehen einige Unternehmen die erforderliche Transparenz immer noch mehr als Gefahr statt als eine Chance. 2012 resultierten gerade einmal 3,1% der Einstellungen in den Deutschen Top 1.000 Unternehmen aus Social Media Kanälen. Allerdings sind die sozialen Medien auch kein Ersatz für die klassischen Rekrutierungskanäle sondern vielmehr eine wichtige Ergänzung, abhängig von Position und Kandidatenzielgruppe. 56,7% der Bewerber finden es laut den Recuriting Trends 2013 gut, wenn Unternehmen sozialen Medien in der Rekrutierung einsetzen. Dennoch setzen über 60% der Jobsuchenden auf klassische Stellenbörsen als primäres Instrument zur Stellensuche. Über 62% der Deutschen Studenten vernetzen sich allerdings schon im Studium über soziale Netzwerke mit Unternehmen, um nach dem Abschluss einen schnelleren Einstieg zu finden (Microsoft/Unicum 2012). Das ist zumindest ein Hinweis darauf, dass diese Generation auch in Zukunft wenig Berührungsängste haben dürfte, Social Media als aktives Element bei der Karriereplanung zu nutzen. Die Recruiting Trends sind eine jährliche Studie der Universitäten Frankfurt, Bamberg, des CHRIS Instituts und von Monster Deutschland. Verschiedene Studien kommen zu dem Ergebnis, dass bis Ende 2012 weltweit fast 1,5 Milliarden Internetnutzer in Sozialen Netzwerken und Online-Communities aktiv waren. 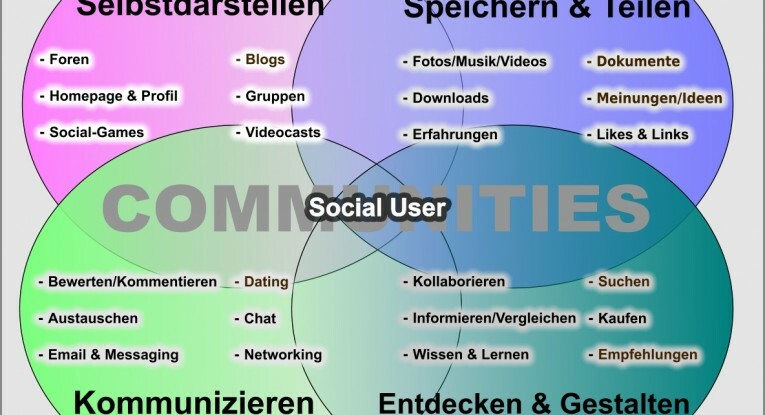 Für Unternehmen ergeben sich durch das „Social Web“ neue Chancen und Potentiale, wie die Nutzung von Online-Communities als Informationsquelle und als Instrument, um mit Kunden und Anwendern direkter zu kommunizieren und zu interagieren. Infolge der deutlichen Veränderung des Nutzerverhaltens im Social Web im Vergleich zum passiven „Web 1.0“ kann auch von einem „Social User“ gesprochen werden. Die Infografik zeigt wesentliche Nutzungsszenarien (Nutzerbedürfnisse) und gruppiert diese in vier Aktivitäten. Ein großer Teil der Aktivitäten vollzieht sich in Online-Communities und sozialen Netzwerken. erische Aktivität, gleichzeitig werden aber auch Inhalte geteilt und in gewisser Weise kann auch Kollaboration der Selbstdarstellung dienen. „Social Games“ sind in jedem Fall auch ein Instrument der Kommunikation und um sich mit anderen Nutzern auszutauschen. Several studies report globally 1.5 Billion active users in social networks and online communities until the end of 2012. For companies the “Social Web” offers new opportunities and potentials to establish a more direct communication and interaction with customers and users. 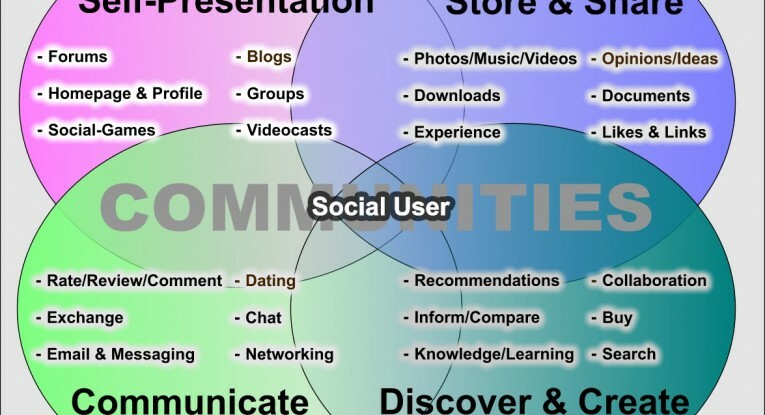 Online communities are an ideal source of information and to start interaction. As consequence of the changed usage patterns in the Social Web compared to the passive “Web 1.0” we will use the term “Social User”. The infographic visualizes the most important scenarios of use (needs) and groups these into four activities. The majority of these activities take part in online communities and social networks. The four groups of activities are (1) “self-presentation”, (2) “store & share”, (3) “communicate” as well as (4) “discover & create”. The four groups are not free of content related overlaps and show several intersections. E.g. “rate/review/comment” is an important part of communication, but also an instrument of self-presentation. “Collaboration” is a creative activity, but at the same time content and ideas are shared. Somehow “collaboration” is also a way of self-presentation. “Social games” support not only self-presentation, but also communication and exchange with other users.